Every year the UNPD (United Nations Development Programme) releases reliable reports consisting of statistical information on different aspects of human development. 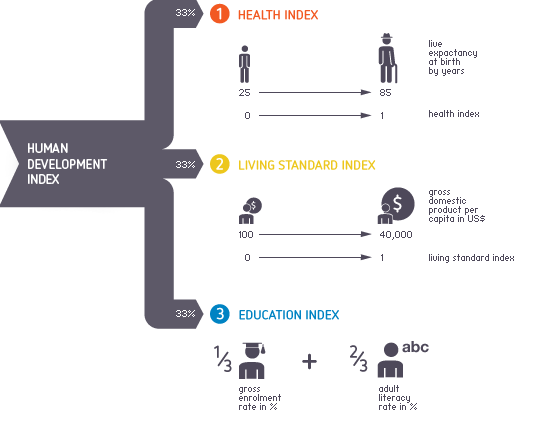 The so called Human Development Index mainly focus on three dimensions which describe the makings of a successful human development: a long and healthy life, knowledge and a decent standard of living. Each dimension is expressed by an index between zero and one and combines applicable and concrete facts for each country. Through this degree of abstraction we are able to compare the countries to each other in terms of human development. The figure on the right side describes the influences of each dimension on the development of humans by its weight. It shows which facts are used to create each single indices. To make the dimensions readable for everyone the application translates the indices by giving the user hard facts on each country´s state. Thanks to www.global-giving.com every user is able to take action by making donations on projects covering the essential needs of low developed countries.